The house is an old mill rehabilitated as a house, it has a kitchen, living room, bedroom and bathroom, as well as a nice garden and terrace. It is located in Alceda, in the Valle de Toranzo, one of the most beautiful areas of Cantabria. The house has all the amenities, fireplace, barbecue and outdoor furniture. The kitchen is on the ground floor, on the first floor is the living room and second bedroom and bathroom. It has 2 mountain bikes. 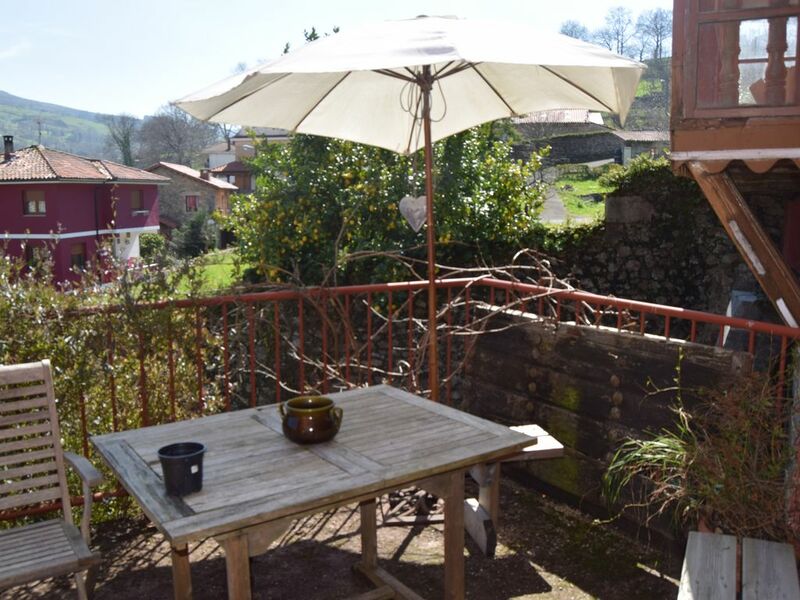 Very close to places of interest such as La Vega de Pas, Puente Viesgo, and less than 40 minutes from Santillana del Mar and several beaches. Pets are allowed inside the house, there is also a kennel in the garden. The accommodation is not suitable for young children as it features a spiral staircase to climb to the upper floors. Alceda can walk around the park, mounted on the zip lines, visit the spa, or walk the greenway to Puente Viesgo. Several establishments to taste quesadas and sobaos. It is one of the three pasiegas villas, founded in medieval times. Very good restaurants to taste the typical "mountain stew." It is a 20 minute drive. It is a very pretty village, with many restaurants, a lovely walk winged laughed. You can visit the caves of the Castle and coins, one of the important in Europe. A 15-minute drive. The mill is filled with objects representing rural life and that of people long gone, it has a rustic charm yet most of the facilities of modern days. The kitchen is a little cramped by the mill wheel and some maintenance on the cooker would be helpful. The first floor lounge is comfortable with views across the village and the top floor bedroom, though dark, is cosy. A good bathroom with ample hot water completes the top floor. All is connected by a modern metal spiral staircase. You have to be fit! There is an outside sitting terrace which could do with a sweep,and tidy up. Parking is up a short, narrow cobble lane and turning is on a steep slope, good practice in manoevering. The village has several small supermarkets and lots of other shops and bars, everything you need is there. The village also has a large wooded park with adventure features. This is an area superb for mountain scenery and walking. Anyone into wild flowers will be amazed. The nearest restaurant is just across the road past the church. Brush up your Spanish, very little English is spoken, but everyone is friendly and will greet you. Mooi verbouwde molen met oog voor detail en heel persoonlijk gemaakt. Het is heel knus. Wenteltrappen van keuken naar kamer en naar slaapkamer/ badkamer. Lekker terras in schaduw. Voor mensen die wat anders willen. Alceda is een klein dorpje ( lintbebouwing) en heeft de basisvoorzieningen, een gemeente zwembad, en een paar cafe’s en restaurants. Restaurante Augosta ligt schuin t/o het huis. Als je wat bijzonders zoekt in Cantabria is dit een leuk huis! La casa estaba bien, pero le falta acceso directo al jardín. Falta iluminación tanto en el jardín como en la terracita de la segunda planta ya que cuando el tiempo lo permite es agradable cenar al aire libre. En la cocina creo que falta un pequeño microondas para dar mayor rapidez. Por otro lado, hemos notado muchísima humedad en toda la casa, dejando incluso la ropa húmeda y fría hasta en los días de calor. Ideal para parejas con amigos peludos. Aunque está repartida en tres plantas, la escalera es cómoda, y está puesto todo con muy buen gusto, con muchos detalles, lo que la hace acogedora y agradable. El jardín no pudimos disfrutarlo mucho por el tiempo, aunque a nuestro gato le encantó. Y la terraza es genial para cenas y desayunos. Buen enclave para visitar la zona. Nous avons passé une bonne semaine dans ce joli moulin. En plus d'être aménagé confortablement, c'est un vrai musée avec plein d'objets décoratifs anciens. On trouve dans la ville d'Alceda tous ce qu'il faut pour faire les courses et boire un verre. La mer et Santander sont à 30km. Avec l'autoroute, on peut aller visiter Bilbao. Mais on peut aussi faire du farniente dans le jardin ou s'attarder sur la terrasse après le repas.